The Barker & Hedges Real Estate Team is dedicated to the promotion and sale of Prairie School style homes throughout Minnesota and Western Wisconsin. Our team of expert real estate agents are well versed in this architectural style and ready to create a customized promotional campaign to market and sell your Prairie School style home. 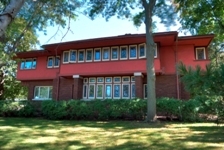 The Prairie School architects, led by the brilliant Frank Lloyd Wright, created some of the most recognizable and historically significant buildings in our modern era. It took unparalleled creativity and dedication to create these properties and when one of these masterpieces becomes available for sale, its marketing and sale can not be left to amateurs. Not only does the Barker & Hedges team employ some of the best real estate agents in the area, it is also at the forefront of new technologies and the kind of custom designed marketing campaigns that are necessary to properly promote and sell these iconic properties. You can find additional information about the Barker & Hedges Team with Re/Max Results on our Minneapolis & St. Paul Real Estate website or feel free to Contact Us anytime.